Search All Santa Rosa Beach Real Estate! The newest “officially named” 30A community of Gulf Place is best known for its colorful Caribbean-style artist colony and popular eateries. Named one of the “Top 10 Beach Destinations” in 2011 by Yahoo Travel, Gulf Place in Santa Rosa Beach encompasses the very best of 30A. Condos for sale at Gulf Place come in a wide range of sizes and floorplans – including studios, townhomes and cabana units, all with superb rental income potential. 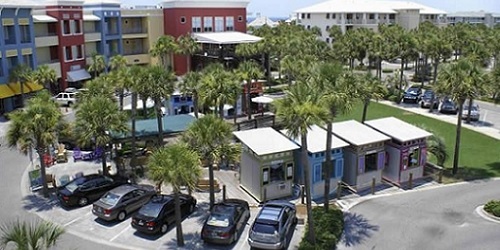 Gulf Place is a dining and shopping hub on 30A’s west end that sits adjacent to a large public beach access and offers something for everyone. The Artists at Gulf Place is a local art cooperative featuring pottery, photography, jewelery, recycled art, ceramics and acrylics – a must when visiting the community. Other shopping options include Soho Beach Boutiques, Santa Rosa Pharmacy, Angel’s Cosmetic & Fragrance Boutique and Celestine’s Special Occasions. Pamper yourself at Ocean Elements Day Spa, or pamper your furry friend at Dapper Dogs small dog salon. Golf lover? The Santa Rosa Golf and Beach Club features 18 challenging golf holes that wind through the sugar-white sands, pristine ponds, and lush vegetation of the community. Dining options are also plentiful, and include the exclusive waterfront “Vue”, La Playa Creative Coastal Cuisine, Miss Lucille’s Gossip Parlor, Pizza by the Sea and Restaurant Fire, serving Napa style American cuisine with a local flavor.